Members of the infamous Bullingdon Club have been banned from holding positions in the Oxford University Conservation Association (OUCA). The body has put the Bullingdon, whose past members included David Cameron, George Osborne and Boris Johnson, on its list of proscribed organisations. The male-only club became notorious for the riotous, drunken antics of its often wealthy, privileged members. OUCA president Ben Etty said it had “no place” in the modern Tory party. The Bullingdon started life in the late 18th Century as a sporting club, dedicated to cricket and horse racing. It evolved into a grand dining society, complete with its own rituals and uniform, which soon became synonymous with undergraduate, public school excess. How real is The Riot Club? In 2004, four of its members were arrested following a drunken rampage at a pub near Oxford, which ended up in them spending the night behind bars and paying £80 fines. Mr Cameron and Mr Osborne’s involvement with the Bullingdon in the 1980s – and raffish photos of them from the time posing in white tie and £1,200 club tailcoats – were a source of political embarrassment during their rise to power. 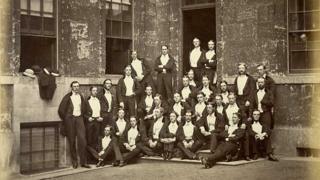 In 2007, a picture of the young Mr Cameron posing alongside other club members, including Mr Johnson, was withdrawn from use by the photographer that took it. In an 2011 interview, the then prime minister suggested “we all did stupid things when we are young and we should learn the lessons”. Boris Johnson went further in a 2013 BBC documentary, saying he was embarrassed by his association with the Bullingdon and his participation in “incredibly drunken” dinners. He described his and others’ efforts to “swank it up” as a “truly shameful vignette of almost superhuman undergraduate arrogance, toffishness and twittishness”. Announcing the ban, agreed at a meeting of OUCA officers, Mr Etty told the Cherwell student newspaper the Bullingdon’s “values and activities had no place in the modern Conservative Party”. “The banning of members of the Bullingdon Club from holding office in the association will, I hope, show that we are moving towards a more open, welcoming and tolerant environment for all,” he said. Last year, the club was barred from taking its traditional picture on the steps of Christ Church College. In 2016, it was reported the club may have to wind itself up due to a lack of new members, with undergraduates shunning it in favour of other societies.